longtime fan since early aughts. show 800 so far is my favorite intro! Just hearing the show now. Fan since 2004. A late congrats and big thank you to Static and Groove for the goldmine that is WEFUNK! Thx for playing Beem's Ducker again! Haha, Freddy aka Torch! Nice one!! AAAAAAAAAEEEEEEEEEE!! Thank you for your releases! I am addicted to them about 5 years ago, and now the music of your station is always with me! It's nice that you're working for so many years! Continue in the same vein. Thanks for keeping the funk flowing! Happy birthday! Congrats guys for those 800 shows ! Keep it coming ! All hail to the kingz of funk! Been listening to yo since show 200. You became a part o my life. hell yeah!! 800 shows, i actually started listening late to your show, it must have been summer of 06, but since than, i can't imagine living without you guys! you mean a lot to me! thx for everything! deutschland funkt mit euch! keep on streaming guys! Congrats for make everyday a best day with funk and soul music. Mad props to the crew, you gave us so much inspiration over the years. Many more to come, fo sho! Thanks for bein' a highlight of my day...everday! Congrats on 800 & here's to many more! YES ... boys !!!! rock on ! CONGRATS ON 800 Groove & Static!!! 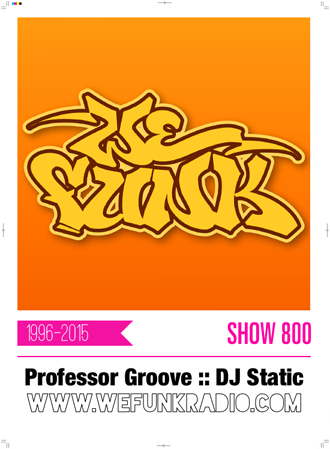 DJs & GUESTS DJ Static, Professor Groove / RECORDED November 21, 2014 / HOSTING PJ, Mike, Oliver & daduke. You can help too! 800 love pt. 3 d.j. cash money, zeit rapha & noise d.